Did you ever wonder what the Tudors ate and drank? This new book by historian Terry Breverton gives us an overview of the very fabric of Tudor life, for both rich and poor. The age saw an amazing variety of new dishes, many of which have been taken from contemporary sources for this cookbook. As well as giving us interesting and useful recipes, the book tells us to forget popcorn – when being entertained by Shakespeare’s plays, theatre-goers enjoyed vast quantities of oysters, crabs, cockles, mussels, periwinkles and whelks, as well as walnuts, hazelnuts, raisins, plums, cherries, dried figs, peaches, elderberry and blackberry pies and sturgeon steaks. Among the Tudor court food purchases in just one year we count 8,200 sheep, 2,330 deer and 53 wild boar, plus thousands of birds such as peacock, heron, capon, teal, gull, shoveler, quail, pheasant, swan and cygnet. Part One of the book explains how the Tudors farmed, their animals and cereals, with the majority of the population having a monotonous diet with very little meat or fish. The first two chapters describe Tudor food and drink, and the differences between diets and the classes. 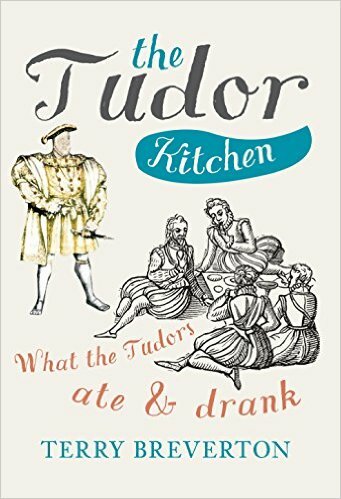 The third chapter informs us about the great kitchens such as Hampton Court and Chapter 4 tells us of royal feasts, etiquette and helps understand why Henry VIII went from a 32-inch waist aged 30, to a 54-inch waist aged 55. Part Two gives us around 500 recipes of the times, which can be tried by curious or enterprising readers. There are some astonishing combinations of flavours, and Tudor cuisine is something we are only now coming to appreciate. EGGES IN MONESHYNE – EGGS IN MOONLIGHT (The Proper Newe Booke of Cookerye c.1557), when the eggs are cooked by poaching in a syrup of rose water and sugar, so that they look like moons. WHITE GINGER BREAD (A.W., A Booke of Goode Cookry Very Necessary for all Such as Delight Therein 1584, 1591). Who knew that the Tudors ate ravioli, crackers, macaroni, rice, crisps, quiche, Jerusalem artichokes, couscous, puffins, badgers and favoured sweet and sour dishes? And that COMPOST is the more attractively renamed COLD SPICED VEGETABLES IN WINE AND HONEY SAUCE? And GARBAGE was a BROTH OF CHICKEN HEADS, FEET AND LIVERS? Or that CRESSEE was a GINGER PASTA CHEESE CHESSBOARD SANDWICH? Or that SWEET POTATOES IN ROSE AND ORANGE SYRUP (Elinor Fettiplace’s Receipt Book 1605) was a popular dish for nobility? Indeed, of LAMPREY PIE Breverton writes: ‘It is a back-boneless, secretive, primitive, blood-sucking, worm-like parasite, and for these reasons I have renamed it Politicians’ Pie’. STUFFED SUFFOCATED CHICKS; HERON ROST – SPIT-ROASTED HERON; and CHAUDYNN FOR SWANNS – SWAN WITH BLOOD AND ENTRAIL SAUCE. And HART ROWS – PIG STOMACH LEGLESS HEDGEHOGS were pigs’ stomachs stuffed with pork, eggs and breadcrumbs, decorated with pastry spines to look like hedgehogs. Breverton’s book is really informative and entertaining, useful for adding to both your historical knowledge and your cooking repertoire. You’ll have great fun learning, and perhaps trying out, these authentic Tudor recipes. Historian Terry Breverton is a former businessman, consultant and academic and is now a full-time writer, having received the Welsh Books Council’s Book of the Month Award five times. He is an expert in Welsh culture and history and has presented documentaries on the Discovery Channel, the History Channel etc. Terry has worked in over 20 countries and has written over 40 well-received books including Richard III: The King in the Carpark; Breverton’s First World War Curiosities; Owain Glyndŵr: The Story of the Last Prince of Wales; Wales: The Biography; Wales: A Historical Companion; Immortal Words; Immortal Last Words; Breverton’s Nautical Curiosities: A Book of the Sea; Breverton’s Phantasmagoria; Breverton’s Encyclopaedia of Inventions; Black Bart Roberts; The Journal of Penrose, Seaman and Breverton’s Complete Herbal. 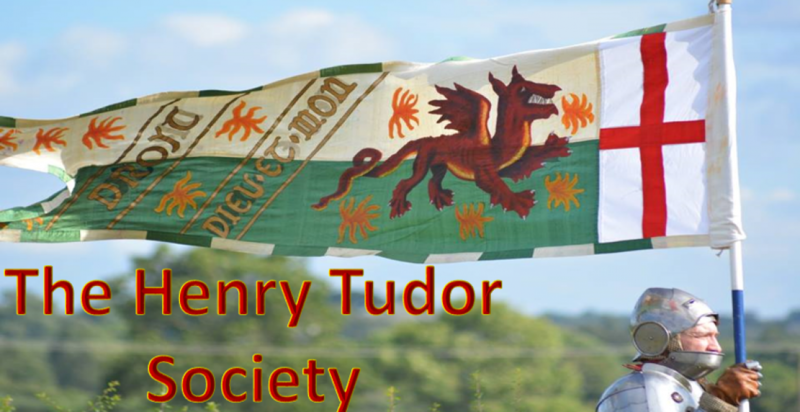 Breverton’s latest releases are ‘Jasper Tudor: Dynasty Maker’, ‘Everything You Have Ever Wanted to Know About The Tudors But Were Afraid To Ask’ and ‘The Tudor Kitchen’, all published by Amberley.